As one of the biggest metropolises in the country, the Houston area is home to hundreds of dental offices – all competing for patients in and around the city. 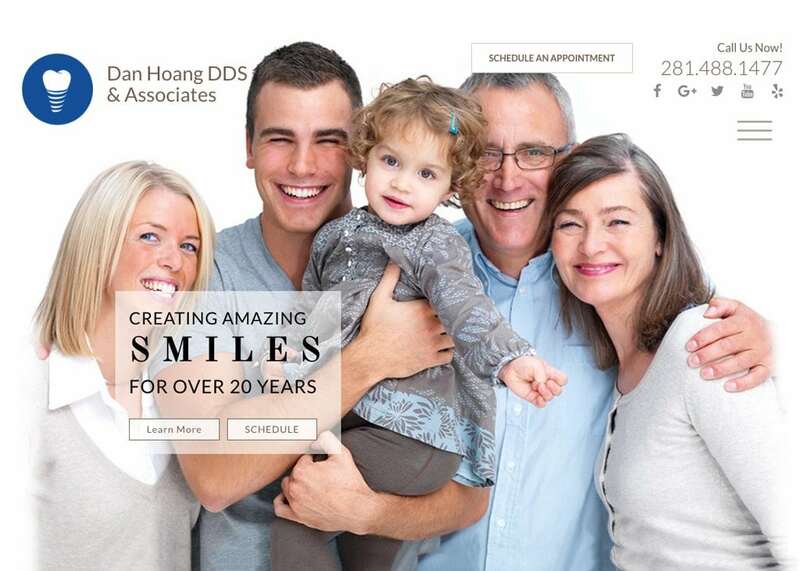 For Dan Hoang DDS&Associates, the key to success is standing out from the competition with state-of-the-art technology and advanced dental procedures that are spotlighted on this website. We utilized this custom dental web design to call attention to cosmetic and restorative treatments available at the office, as well as the family-friendly preventive and wellness care. This website has seamless borders and big, captivating pictures that demand the attention of the viewer right away. Visitors are briefly welcomed with a picture of the office exterior and an introduction to Dr. Hoang and the mission of the practice. From there, visitors have the opportunity to explore various areas of interest, from the services and technology to the practice blog and several positive patient reviews and testimonials. We also created a ‘new patient’ section that offers a tour of the office and downloadable patient forms. The colors chosen for a custom dental website are important, as they set the tone for the user experience. For this site, we opted for a light and bright appearance that pairs joyfully with the exuberant smiles of the families featured on the home page. Muted neutrals play well to natural light, giving the site an uplifting aesthetic appeal. This website features several modern design elements. Instead of a full-width upper menu bar, we condensed site navigation into a small, expandable menu in the top right corner of the screen. To diversify the content on the site, we also included a dental videos and dental article section to provide comprehensive patient education in a way that appeals to all types of patients. Other attractive assets include scrolling patient testimonials on the home page, an interactive map of the practice location, and large tile images that seemingly ‘come to life’ when selected. The competition is thick for this practice, but there is no other dentist in Houston with a website like the one that belongs to Dan Hoang DDS&Associates. We offer multiple opportunities for visitors to schedule an appointment, as well as to find out about the experiences of other satisfied patients. To highlight the history and reliability of this established practice, we also note in bold print that the office has been serving Houston patients for more than two decades. Finally, we included a smile gallery that provides a glimpse into the types of results patients may expect after treatment at this office. This website projects a family-friendly image that appeals to people of all ages. Instead of putting the spotlight on the staff and dentist, we used carefully selected images to turn the attention back to the patients. This is in keeping with the office’s goal of putting patients first, every time.